Now for a holiday treat – or maybe more like jewish/christian/pagan horror. 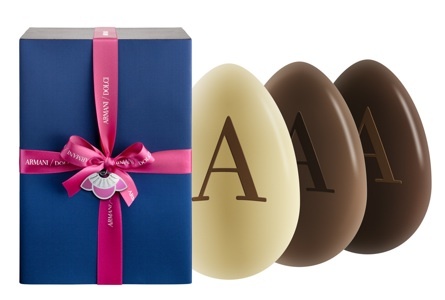 The Armani Easter Egg! Easter is such a weird thing in the southern hemisphere, because it comes preceding Autumn. Originally a pagan festival celebrating the Spring equinox (hence those pesky wabbits and delicious eggs), it morphed into a Jewish festival (Passover) to celebrate the Exodus of the 'Children of Israel' from slavery in Egypt, and then into a Christian festival celebrating the crucifiction and resurection of Jesus. Now apparently its a special occasion for Giorgio Armani.